In 2005 a work group was formed to develop a 10-Year Homeless Housing plan, designed to reduce homelessness in Thurston County by 50 percent by July 2015. At the request of the Inter-Jurisdictional Forum on Homelessness and various leaders in the community, Catholic Community Services created Drexel House to assist in reducing homelessness. 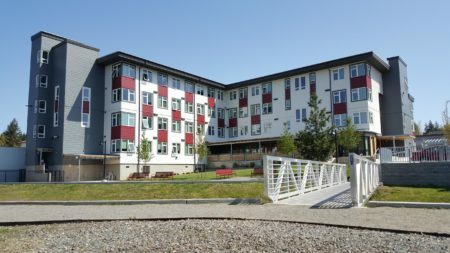 Drexel House opened in March 2007 and is the first and only facility in Washington State that combined emergency shelter, transitional and permanent housing at one location. In July of 2017, the long-time dream to build more housing for homeless veterans was realized when construction of Drexel House II Veterans Housing was completed. Drexel House II provides added 50 additional permanent supportive housing units for veterans. The Drexel House campus now provides a continuum of housing care in a safe environment that fosters respect and dignity, with an emergency shelter for 16 men and 86 units of permanent supportive housing for men and women coming out of homelessness. At Drexel House, we serve homeless men and women who first screened through SideWalk’s coordinated entry and are rated as the most vulnerable members in Thurston County. Case management, referrals, transportation and supportive services are provided on-site. Want to start a club or group at Drexel House? Become a volunteer. Like us on Facebook for the most up to date information! Drexel House provides a 16 bed emergency shelter for men who are currently homeless in Thurston County. The Shelter program is 90 days and is free of charge. It is more than a warm bed; it is a program which includes promoting residential stability and increasing self-determination. Case Management services are available. Drexel House provides 300 square foot, furnished, studio apartments for men and women in Thurston County. The program is for men and women who are currently homeless, are capable of living independently and have first been screened and deemed eligible through Sidewalk. Residents pay 30% of their verified income towards their rent. Case Management services are available to all residents. Support Services — A Case Manager to assist each person to develop a personal service plan with short and long term goals consistent with positive habits to meet their goals. Computer Usage — Computers are available for resumes, job searches, e-mail and to practice typing. Including access to supplies, copier, printer, fax and phone. Enrichment Classes — Several areas are covered to reduce barriers holding individuals back from success. Financial / Budgeting, Renter Responsibility, Cooking, Resume Building, and more. Nurse’s Station — Local volunteer nurses and physicians provide basic medical support and referrals. Savings Plan —To help clients save money for a life after Drexel House. Security and Safety — 24 hour/7day staffing to provide the most effective security and support. Kitchen Facilities — There are personal refrigerators and storage space for each client. A full kitchen is available for clients to prepare meals. Dormitory — All sheets, towels and toiletries are provided, including shower and restroom facilities. Locked storage available. AA and NA Meetings — Held weekly on site. Other support groups may use the Tom and JoAnn Finch conference room. Van Rides — Transportation for appointments that are not easily accessible by walking, riding a bike or using public transportation. Free and reduced bus passes are available. To be added to the waitlist for SHELTER, please call SideWalk at (360) 515-5587 or visit them here. To be added to the waitlist for HOUSING, please call SideWalk at (360) 515-5587 or visit them here. If you are or know of a Veteran in Thurston County needing assistance, please contact Lacey Veteran’s Hub here.